Back pain is one of the more frustrating problems for those who ride horses—especially performance horses. So much conflicting information exists about diagnosis and treatment. Back pain is not—or at least shouldn’t be—easy to diagnose or fix. Why do horses get back pain? Many conditions can result in equine back pain, including arthritis of the vertebrae, which is incurable. People of various shapes, sizes, and degrees of finesse and athleticism contribute to equine back problems by riding horses of various shapes and sizes that also possess varying degrees of finesse, soundness, and athleticism. Throw in various disciplines that require horses to pull, turn, flex, jump, round up, etc., and you have quite a recipe for potential back problems. Back pain isn’t a disease. Rather, it’s a sign of disease. In order to adequately address back pain, the attending veterinarian must address its cause, which can be very hard to determine. Difficulties in diagnosis are probably one reason why there are so many different opinions as to the proper way to diagnose and treat equine back pain. Many things can cause back pain in humans: disk breakdown, spasms, tense muscles, ruptured disks, psychological issues, sprain injuries, fractures, accidents, aging, weight, physical condition, scoliosis, spondylolisthesis (new bone growth), arthritis, spinal stenosis (narrowing), pregnancy, kidney stones, infections, endometriosis, and fibromyalgia. The list is probably no shorter in horses. Back muscle soreness can be caused by many things, including bad saddles, bad riding, lack of exercise, normal exercise, or as a result of issues elsewhere in the horse’s body. Problems with the vertebrae can be in the vertebral body, or, much more controversially, in the spinous processes. While horses probably don’t experience disc pain—equine intervertebral discs are quite different from human discs—many other structural problems have been documented. Furthermore, while horses probably don’t show signs of back pain because of their own psychological problems, issues with owners, trainers, or people who diagnose and treat back pain could be a problem. As a result, probably a good number of horses don’t really have back pain but get diagnosed and treated for it anyway. In humans, developing a diagnosis of back pain is usually easy. The patient visits the doctor (or therapist) and says something like, “My back hurts.” Unfortunately, that simple diagnosis is not an option when it comes to the subjective problems of equine back pain. Examination requires a good deal of pushing, pulling, and prodding, saying, in effect, “Does that hurt?” If the horse does something that indicates a pain response, the horse may receive a diagnosis of back pain. Unfortunately, given the vague nature of the complaint, as well as myriad ways in which equine back pain can be demonstrated, it’s often possible to find just about anything—normal or otherwise—to support a diagnosis. Add in so-called “subclinical” back pain; that is, back pain that allegedly exists, but isn’t causing any obvious, objective clinical signs, and you’ve got a real can of worms. The bottom line is that the diagnosis of “back pain” isn’t something that should necessarily come easily. It is also a fact that back pain may be secondary to other problems, especially problems of the musculoskeletal system. In fact, it has been recently demonstrated that thoracolumbosacral asymmetry and reduced range of motion that occur in association with lameness can be immediately changed using diagnostic analgesia of the affected lame limb. Rider-related problems are yet another consideration; studies of horse-saddle-rider interactions are limited and determining their effects remains challenging. In human medicine, other than the patient telling the doctor that his or her back hurts, there’s not a lot of reliable, objective evidence to support a diagnosis of back pain with many patients. Tests such as radiographs, magnetic resonance imaging, scintigraphy, or a computed tomography, generally do not correlate well with clinical signs of back pain in humans. It’s the same in horses; there is a wide range of radiographic abnormalities of the spinous processes seen in horses with or without back pain, and many vertebral problems appear to arise from the articular facets, which are difficult to image in the field. In human medicine, frequently the root cause of back pain cannot be determined with any certainty. The situation is virtually the same in horses. When it comes to the diagnosis of equine back pain, there’s one disturbing fact: There is no single, objective test that can be used to give a reliable diagnosis of the cause of back pain in the horse. 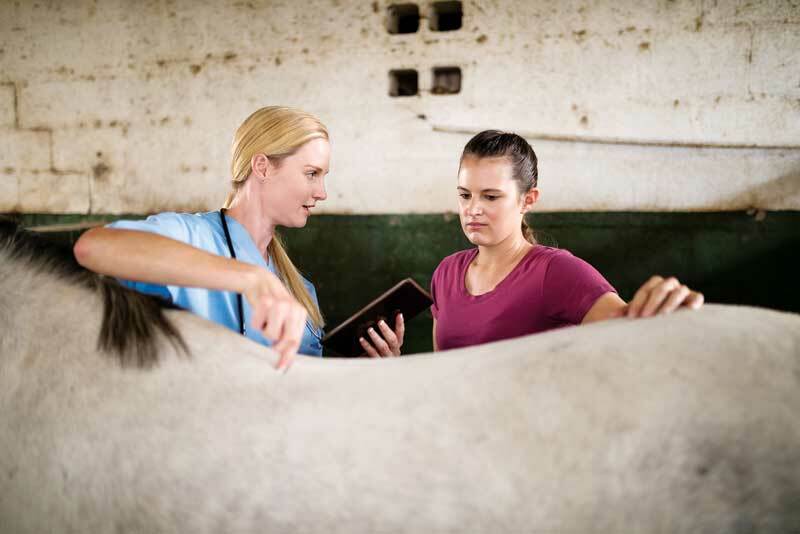 Proper diagnosis may be a combination of careful palpation, assessment of associated lameness, saddle and pad fit, and rider variables, in association with other diagnostic modalities.